Gold Man is a perfume by Amouage for men and was released in 1983. The scent is floral-animal. Projection and longevity are above-average. It is still in production. And although I was a bit shocked by the first impression, I then courageously devoted myself to careful sniffing (actually mainly because the toilet was occupied and I couldn't wash it down immediately...). The soap-clean "Uuuiiih" impression was repeated a few times until I got used to it. Unfortunately after that my nose was so drunk that I could only concentrate on the total amount of the fragrance for a while and then I was astonished and surprised to find that GM (at least for me) smells just like the curd soap, which my grandmother used to have as a big rectangular block in the bathroom - just in extremely highly concentrated form...! Well, what more can I say about that? The details of the smell have already been analysed here. The smell is really, really extremely intensive - with me it keeps loosely between 12-14 hours, basis even up to the other day, thus completely gently dosage, it remains also then still very "loud"...! And - only use outdoors, or when you are alone. In the office you definitely make yourself a target - I tried it once, so you better leave it...! 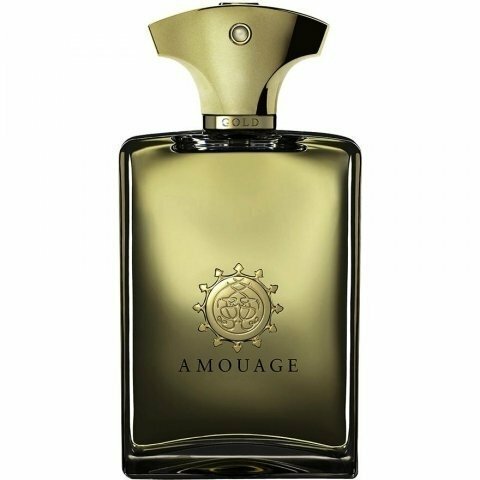 On me, Amouage Gold for Men just doesn't work - at all. It smells like one thing on my chest, another on my arm where it totally falls apart, something else on cotton wool in a jar, different on my cardigan. I was expecting something exceedingly rich, opulent, unctuous, radiant, but overall was left wanting. On my skin it comes across as lower quality, less inovative, just less than perfumes such as Aromatics Elixer, Mon Parfum Cheri Par Camille, Nuit de Noel, to name a few (of mine). I think the nearest I can get to what people who love this perfume smell is on a ball of cotton wool placed in a jar in a warm spot near the heater. Then it smells a little like Caleche, more like Amouage Gold for Women. Less bright than Caleche with less sparkle, more powdery, denser in the musks, less projection. Having used up my sample of Gold for Women so going only by memory Gold for men is less floral, a bit sour, denser in the musks which are cloying in comparison. On my chest Gold for Men is a dirty, lemony, super sour, jasmine. Really awful on my skin its development is a complete shocker and not in the least like I expected from my tester strip. Five or six hours after application, my forearm skin smells beautiful with a dry, woody, oakmoss earthiness. Rather like the far dry down of Aromatics Elixir although somewhat tamer and this phase lasts only for an hour or so. Two or three separate smells take it in turns to waft to my nose. First I pick up a fruity lemon, a little shampoo in feel, a little sour, a little off like a toilet block cleaner. Then there is a heavy vanilla mixed with jasmine and rose which reminds me of Teint de Neige but not so powdery and a bit dirty, a bit vanilla and floral beeswax furniture polish. My cardigan has a slight smoke to it, a bit resinous. There seems to be a whole menagerie of musks. Something about it keeps bringing to mind suntan lotion and it reminds me of back stage at body building competitions where the air hangs heavy with a myriad of suntan oils, hair products, makeup, perfume, fake tan, and hard work. On my forearm this is one of the worst behaved perfumes I have ever tried as it totally falls apart and won't give an overall impression; it's like moving from room to room with a different room spray in each - most disconcerting. I am going to save the remainder of my sample so that I can see whether it performs better for me in the hot summer sun. I have other perfumes that only work for me in the heat so I am interested to see if this one will join that motley crew. The Omani perfume company Amouage had been on my radar for quite some time before I managed to pluck up enough courage to order a batch of samples of some of their fragrances. Having tested about a dozen of them, I can now see that ignoring this firm for so long was an act of utter foolishness. I must admit most of them are right up my alley: memorable, statement-making scents, composed of only top-notch ingredients. The first one I’m going to review is Amouage’s ur-masculine perfume, Gold Man. From the very first spray, Gold Man took me by surprise- and a very pleasant one at that. It opens with a burst of floral notes, the most detectable one of which to my nose is lily-of-the-valley. Nevertheless, the fragrance remains floral only for a minute or so on my skin until soapy notes emerge. I remember that when sampling Gold Man for the first time, I had to check I was not actually testing its female counterpart since such a straightforward floral-soapy accord can rarely be found in masculine scents. It quite literally made my heart beat a tad faster! The soap-and-flower accord usually lingers on my skin for about half an hour. After that, it undergoes a gradual transformation with the arrival of musk and civet, thanks to which the fragrance adopts a more animalic character in the base. Yet the soapy notes never totally yield to the musk and civet, and thus prevent the scent from becoming too animalic. I just couldn’t help falling in love with Amouage’s Gold Man! There are so many things about it that make my nose and heart rejoice whenever I put it on: its genderbending composition, superb blending of its notes as well as its effortless elegance. Despite not being a scent for all occasions, if the right one comes along, take my word for it: wear it, but be prepared to leave a few broken hearts in your wake. Exquisite! I re-visited Gold PH today. My first try was a failure and I did not like it, I wonder why. Today I found one of the most luxurious perfumes I ever tested. As good as Bogue's Maai. Or even better. An amazing dry down. This is the scent of a harem. So, I just can dream. Gold is very floral with rose and lily of the valley notes to start, and then stays floral throughout all the way to the dry-down (which adds a nice helping of musk) I guess I have not noticed the civet note like others, as the scent only has a slight animalic smell to my nose. Gold is tremendously potent (and I mean POTENT), with super projection and sillage as well. Unlike some, I can indeed see someone pull this off as I do believe this is wearable from a male perspective. That said, it takes a *very* confident man, and probably most will feel a tad uncomfortable wearing this (myself sadly included). Nice effort, just limited audience appeal. 3 out of 5 stars. I had no notion until I smelled Gold Men that I'd formed an image (fantasy) in my mind of what the old-school animalic floral/orientals of the early 20th century were. On smelling Gold Men, I realized that I did, and that this was it. Sensational, huge powdery animalic fragrance. Now I understand why these old perfumes were both powdery and animalic. If you do it right, it's brilliant. As spectacular a ride as the top and heartnotes of this perfume are, the drydown is one of the best I've smelled. It's there, softer and quieter than the topnotes, but it remains fully-fleshed and complete. The drydown isn't just a ghost of the heartnotes. Gold Men is powerful and distinctive. Not for shrinking violets, not for somebody who doesn't want to be identified for his scent. Certainly not for someone who wants to read as contemporary in a pop or trendy sense. Gold Men is more a leader than a follower in this respect. It is one of a very few fragrances that I could wear forever and be utterly happy.